SLAP tears are fairly common injuries of the shoulder. A SLAP lesion, which stands for Superior Labrum Anterior to Posterior, is a tear of the labrum at the top of the shoulder. Pitchers and other throwing and overhead athletes often suffer a SLAP tear. SLAP tears are also seen in contact and collision sports in which an athlete is hit on the shoulder or lands on the shoulder or outstretched arm. The diagnosis of a SLAP tear can be tricky, because there is often no specific event that started the athlete’s pain. You could notice pain and decreased ability to lift weights or throw for a long time before you get your shoulder evaluated. You might complain of vague pain in no particular location, although many athletes will complain that the pain is felt deep within the shoulder. There are a variety of shoulder exam tests, but no single test can prove you have a labral tear. Often the diagnosis can coexist with other shoulder issues, including subtle instability of the shoulder, tightness of the posterior capsule of the shoulder, and rotator cuff impingement or tears, making the diagnosis even more difficult. Nonsurgical treatment is usually the first option. Physical therapy for strengthening the muscles around the shoulder and upper arm, stretching the posterior capsule of the shoulder, working to improve the mechanics of shoulder motion, and core strengthening can decrease a patient’s symptoms. In high-level athletes, especially pitchers and other overhead athletes who are not improving, an MRI, or more specifically an MR arthrogram, may be performed. This is a test in which a radiologist injects contrast into the shoulder prior to an MRI being performed. The contrast within the shoulder will travel between the glenoid and the labrum if a detached SLAP tear is present. The addition of contrast can improve the accuracy of the test. If a patient does not improve with rehab and cannot do his or her desired activities, arthroscopic surgery can be an option. The technique employed surgically depends on the type of tear found. The surgeon will look at the labrum and determine if the tear is stable or not. 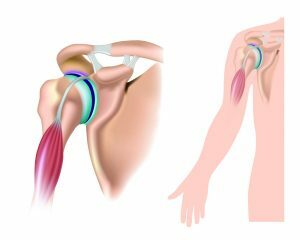 If the labrum and its attached biceps tendon can be pulled off the glenoid, then the labrum and biceps tendon anchor must be repaired back down to the glenoid. If the labrum is frayed but not unstable, the surgeon can use an arthroscopic shaver to smooth out the labrum. In this video, I discuss SLAP tears and the signs and symptoms of these injuries. I then explain rehab and surgical treatment options for active patients. How can I get my knee straight after ACL surgery?